John and Mary Lou Stewart recently popped over from Canada to visit the area including Kirkcowan where there relatives lived many years ago. The Stewart family lived at East Crosherie. My great grandmother and John's great grandfather were brother and sister so it was good to finally meet up with John and Mary Lou after having corresponded by email for a number of years. They are planning to write a piece about their visit which I will reproduce here in due course. 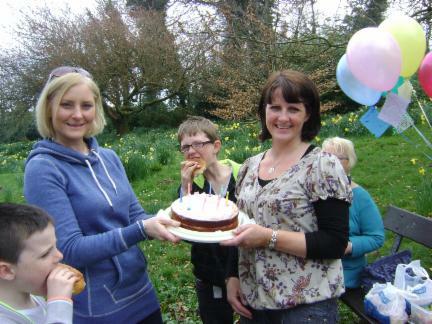 Friday 15th April 2011 was a birthday to remember for the late Malcolm McCutcheon’s daughter Jackie. Malcolm had always planned to take his grandchildren to see all the places of his childhood that he so often talked about. Sadly Malcolm passed away earlier this year never having fulfilled his dream. However, his widow Betty and the family decided it would be a wonderful tribute to Malcolm to make the trip - and so a coach trip for the family was arranged to Kirkcowan( not quite as ‘out of the world’ these days). 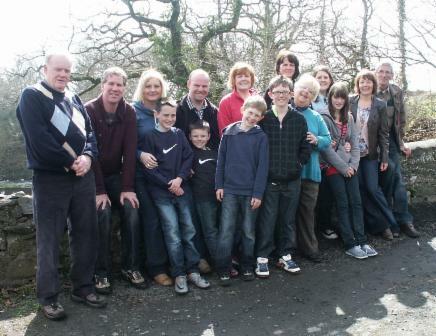 The party of 15 included Malcolm’s widow (Betty), his son (also Malcolm) and wife Eileen with their two children Jack and Owen, Malcolm’s daughter (Jackie) and husband Kevin with their children Gillian, Megan, Callum and Aidan, Malcolm’s brother John and wife Helen, Malcolm’s sister (Lorna) and husband Brian. 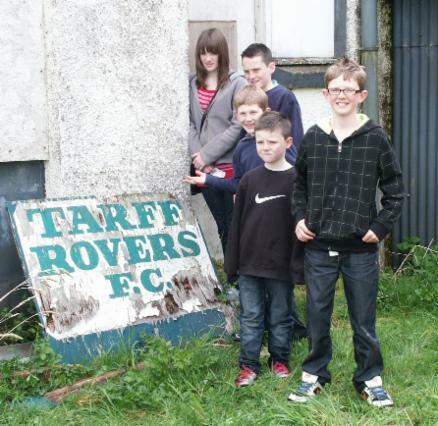 Onwards to Balgreen Park – the home of the former Tarff Rovers, where the children posed beside the decaying Tarff Rovers sign and walked on the hallowed ground. Malcolm was a dedicated supporter of the team and attended many of their games with his brothers John & Jim and their friends. One of Malcolm’s stories was about a memorable day in 1954 when Tarff were due to play Partick Thistle in an all ticket Scottish Cup Tie. The pitch was a little uneven for such an important match which it was hoped would be solved by using a road roller borrowed from the nearby quarry at Boreland Fell. Sadly the inevitable happened and the roller sank into the ground with disastrous results. Quickly mended the game went ahead and Partick Thistle ‘scraped through’ by a mere nine goals to one, the Tarff goal being scored by local hero Buff Douglas(from Stranraer). At the match were devoted Tarff fans Malcolm, his brother John and their friend Billy Whitson who consoled themselves afterwards by collecting all the empty beer bottles left by the Glasgow visitors. These were exchanged for what must have been a ‘small fortune’ , in 1954, at the Tarff Hotel. A leisurely stroll took the family along the banks of the rushing River Tarff to Lincuan Bridge, locally known as the Auld Weel, as this is where the wheel that operated Tarff Mill was located, driven by water from a lade flowing from Thomas’s Dam, sited a little further up the road past Balgreen Park. 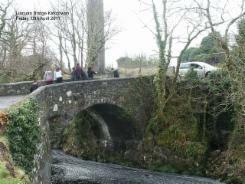 The wheel has gone and the lade is now blocked but the old bridge, which is listed, still stands with the Tarff flowing under it towards the dam which redirected water to drive the old Waulkmill. Neither of the mills function any more, indeed the only remaining structures are the chimney stacks which proudly mark the sites. 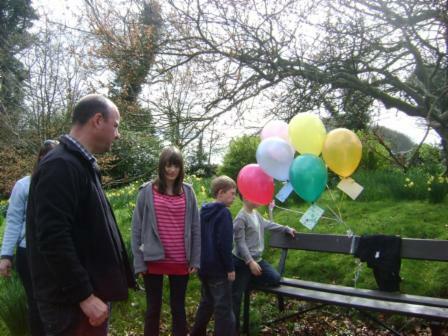 Next and final stop was up to the Dickie Wood to release balloons in Malcolm’s memory - a poignant moment for the whole family. Jackie read a poem and the children’s balloons, each one a different colour significant to each child, had a message tied to it. 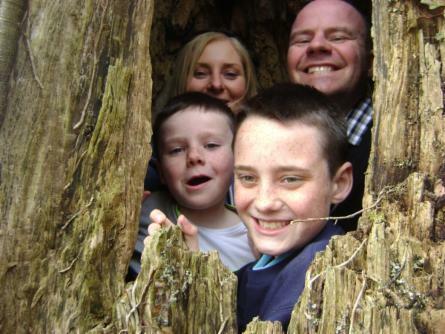 In the Dickie Wood there is a large hollow tree which provided the basis for a competition to see how many people could fit into the hollow – this was won by daughter Jackie and her family, all six of them. The photo is of the runners-up. 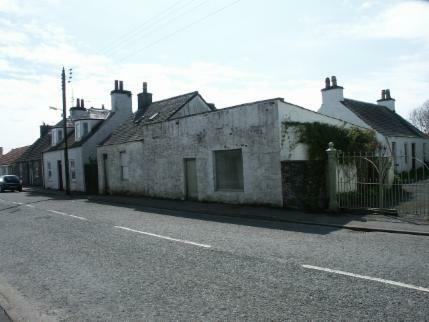 Although an itinerary had been carefully constructed which included onward journeys to Newton Stewart, Gatehouse of Fleet and Castle Douglas the time was happily spent in Kirkcowan. 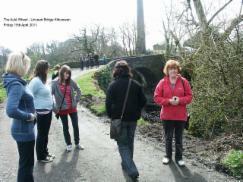 The trip was wrapped up with tea and cakes in Kirkcudbright before the journey home via Moffat for dinner. 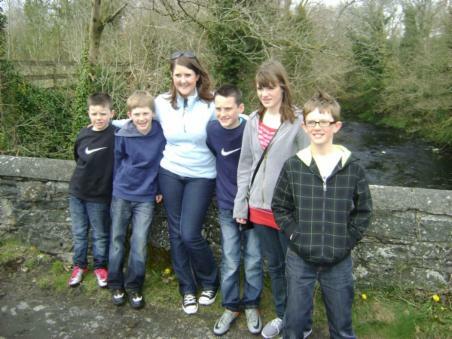 The glorious spring sunshine was an added bonus and everybody, including the children, thoroughly enjoyed the outing - There is no doubt that Malcolm would have been very proud to know that his wish had been fulfilled so successfully. – a red letter day all round.